What better way to pass a rainy afternoon than with good friends and good food? 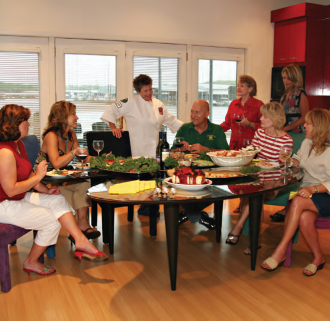 Chef Cathy Zeis did the cooking for a leisurely lunch at the Jack Radke Family’s dockominium on Lake Texoma. (L-R) Lisanne Anderson, Cheryl Plauché, Nancy Anderson, Vickie White, Heather Adams, Mary Kolb. Homestead Winery’s White Rose of Ivanhoe, Muscat Canelli and Prairie Rose. By most accounts the business of photographing kids on ponies began not long after the camera was invented. There are tintypes in museums with faded images of boys and girls astride, usually Shetland horses.